Revenge is sweet – as boxer Junaid Bostan now knows all too well. The Rotherham fighter overturned a victory against the only opponent to beat him in the last 18 months as he claimed Tri Nations gold last weekend. Bostan was on England duty against Wales and Scotland in the GB Schools Three Nations Championships, held in Doncaster. 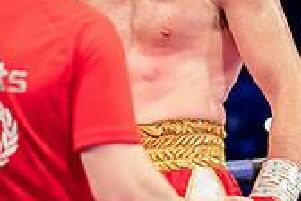 With only two boxers present in the 43kg category, the gold medal came down to a straight bout between Steel City ABC’s Bostan and fellow Englishman Simon O’Donnell – the fighter who beat him to the England Boxing Schools title last month. On the wrong end of a split decision last time, Bostan grabbed his revenge with a 2-1 triumph to claim the gold medal. Steel City ABC coach Grant Smith was delighted with the Clifton Community School pupil. He said: “It was great to see Junaid winning gold and getting that win back. “He didn’t box to instruction in the Schoolboy final between them and ended up having a bad last round which cost him the win. “That kid is the only lad he’s lost to in the last 18 months so he’s got that back now. “He boxed brilliantly and it’s well deserved. He’s coming on great all the time.